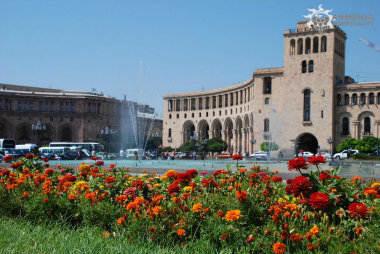 Day 1: Arrival – Check in hotel – Walking city tour and acquaintance with Yerevan city center - Dinner-Overnight . Day 2: Yerevan City Tour: Matenadaran's complex- Cascade – Gafesjian Museum- Opera and ballet building – Republic Square – Tsitsernakaberd Museum – Dinner - Evening walking tour. Finishing breakfast tourists will start their city tour from visiting Matenadaran. Matenadaran's museum complex placed in the institute’s old and original building. Formerly it was just one exhibition hall but now it consists from 15 halls in which thousands of temporary, inconstant and exceptional exhibits are displayed. Manuscripts, fragments of manuscript, papers, old and ancient writings, distinct bindings, special miniatures and many more are displayed here. The whole database consists of 23 000 manuscripts. After visiting Cascade. Cascade is a huge stairway in Yerevan city center. It connects the city center Kentron with the neighborhood Monument. After we will visit original Gafesjian museum. In 2002, the USA Gafesjian museum fund opened in Yerevan “Cafesjian museum-foundation”. It's aim was to create a first museum of modern arts and a cultural center in Armenia. Then visiting beautiful Opera House whose architect was famous Armenian Aleksandr Tamanyan. Drive to Genocide Museum. Genocide Museum is Armenia's official monument dedicated to the victims of the Armenian Genocide of 1915. It was built in 1967 on the hill of Tsitsernakaberd. Dinner in one of the Armenian restaurants with national cuisine. Overnight. Day 3: Yerevan - Geghard Monastery - Garni Temple - History Museum of Armenia - Ararat Brandy Factory - Parajanov's Museum - Dinner. socialist realism (the only sanctioned art style in the former USSR).The museum's collection comprises of 1400 exhibits and includes original collages, paintings, assemblages, drawings, hand-made dolls and hats. Dinner with national cuisine, overnight . 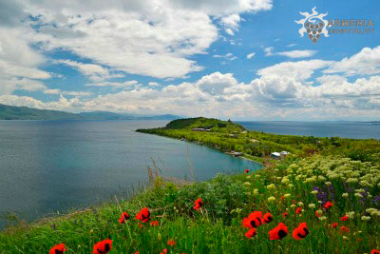 Day 4: Yerevan – Erebuni Museum and Fortress - Lake Sevan - Sevanavank - Yerevan - Dinner. After breakfast visiting Erebuni museum. The fortress of Erebuni is located on Arin-Berd hill. It was built in 782 B.C. by the Urartian king Argishti the first. During the diggings started in the 20th century a wedge writing scripture was found hence the history of modern Yerevan starts from that place. On the top of the hill, the ruins of the citadel and the wall-paintings reveal the high art achievements of passed centuries. Erebuni museum shows the findings that have been excavated in the territory of the fortress.After we'll proceed to the Lake Sevan that situated at about 70 miles north from Yerevan. This beautiful blue lake is 2,000 meters above sea level and is one of the highest among the freshwater lakes in the world. Then we will observe 2 churches of Sevanavank -monastic complex located on a semi-island on shore of Lake Sevan and consists of two churches. Primarily the monastery was built at the southern shore of a small island in 874 AD. Driving back to Yerevan. Dinner and Overnight. Day 5: Yerevan - Echmiatsin Cathedral - The Treasury Museum of Echmiadzin - Departure home. Breakfast and check out .Driving to Echmiatsin. The main Cathedral of St. Echmiatsin was built in the 4th century (301-303). 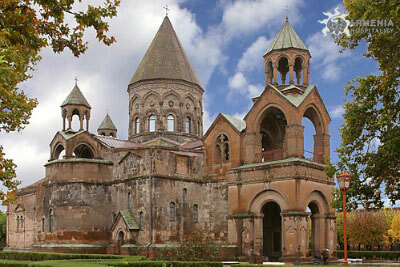 It is one of the oldest churches in the world and home of the Supreme Catholicos of all Armenians. 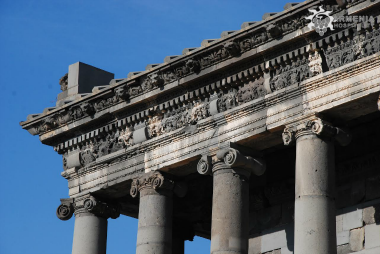 Armenia was the first country in the World to accept Christianity as a state religion. Echmiatsin is the center of the Armenian Apostolic Church. According to the legend, the church was built on the place where the vision of Jesus Christ was come to Grigory the Illuminator during his dream. The inward of the church is covered with wall paintings constructed by Hovnatanyan family.Main Cathedral and Churches of Echmiadzin are included in UNESCO world heritage list. The Museum "Treasures of Echmiatsin" is located in the south-east part of the Cathedral. Unique precious saint relics and religious art are stored in the museum. After Echmiadzin driving to the Zavrtnots International airport.